But what if there’s a wholly different interpretation of what is responsible for the UK’s recent economic recovery? What if it’s all down to QE? It seems ironic now but the IMF had only just concluded, on the very eve of the crisis, that monetary policy was to be preferred for cycle management and that fiscal policy was best used for political and redistributive aims. Discretionary fiscal policy at best provided “modest” countercyclical stimulus and even then only if it obeyed the rule of TTT: timely, targeted and temporary. This last because any fiscal stimulus that became entrenched tends to be neutralized by so-called Ricardian equivalence: wider government deficits trigger lower household consumption in anticipation of higher future taxation. Ricardian equivalence could explain why corporates across the developed world, unconstrained by the debt that bedevils households, have nevertheless failed to take advantage of low rates to invest this downturn. According to the Office for Budget Responsibility (OBR), five years on from the original banking crisis, the UK government still faces a £111bn (almost 7% of GDP) budget deficit in 2013-14. To close the deficit by 2018, despite a forecast rise in total managed expenditure (TME) from £718bn to £775bn (1.55% per annum) OBR forecasts show annual taxes have to rise 27% (5% a year); from £577bn to £733bn. As Prime Minister Hashimoto discovered with Japan’s disastrous 1997 sales tax hike, it is all too possible during resolution to raise the tax rate and yet lower the tax take. It is therefore imperative that the UK deficit reduction plan is based on nominal economic growth rather than a more draconian tax code. Normally this could be ensured by easier, counter-cyclical monetary policy. However, conventional monetary policy has an Achilles heel. Whereas fiscal policy is conducted via government agencies, the execution of monetary policy is sub-contracted out to the private sector, namely the banks. This is all well and good as long as the banks are able and willing to faithfully transmit policy to the wider economy. The very nature of a financial crisis: i.e. the clear and present danger of systemic bank insolvency necessitates chronic balance sheet repair. Typically, from start to finish, bank loan contraction takes almost six years for single countries and most likely longer for the sort of, thankfully rare, synchronous crisis we still seem to be going through. A bank is effectively insolvent (i.e. unable to function) if its capital ratio falls below the regulatory minimum. Our banks are subject to the Basel rules and operate at close to the maximum allowable leverage. They cannot therefore bear much in the way of losses (net of earnings) in any single year; hence the chronic nature of resolution. As new lending ceases and non-performing loans (NPLs) are gradually written off, bank losses become at the same time manageable but also stubbornly persistent. The problem for the UK economy is that, at least for those solely reliant on bank lending for their credit like households and SMEs, during bank balance sheet repair these sectors haven’t been able to get credit. The outright decline in the stock of bank lending in 2009-10 would, all other things being equal, have shrunk broad money supply and that is the definition of deflation. 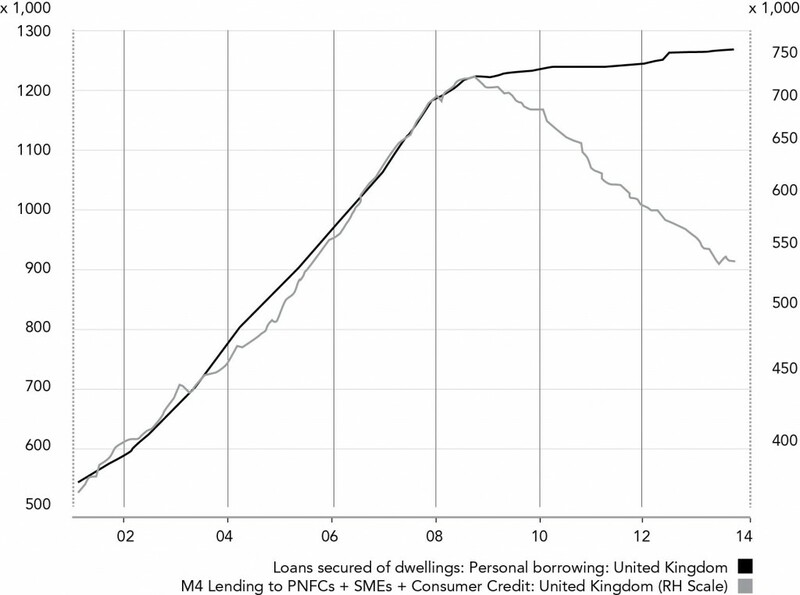 The sort of sustained and significant decline in domestic bank lending the UK experienced would have undoubtedly engendered not a Great Recession but a full-blown depression; as indeed we saw in peripheral European countries like Ireland and Greece. However, although conventional monetary policy relies on the plumbing of the banks to reach the wider economy, there is another way. Unconventional monetary policy, a.k.a. quantitative easing (QE), required the Bank of England (BOE) to buy assets, not from the banks as usual, but from the real economy. By crediting the sellers’ bank accounts, the BOE artificially expanded bank deposits, which is what we otherwise know as money supply. Because large-scale buying of this sort could naturally distort markets, Mervyn King confined QE purchases to the biggest, deepest market of all, the Gilt market; though largely avoided buying gilts at issue, which would look too much like debt monetization. In the US, Ben Bernanke’s Fed had fewer qualms and predominantly bought residential mortgage backed securities (RMBS) in order to deliberately lower fixed mortgage rates too. 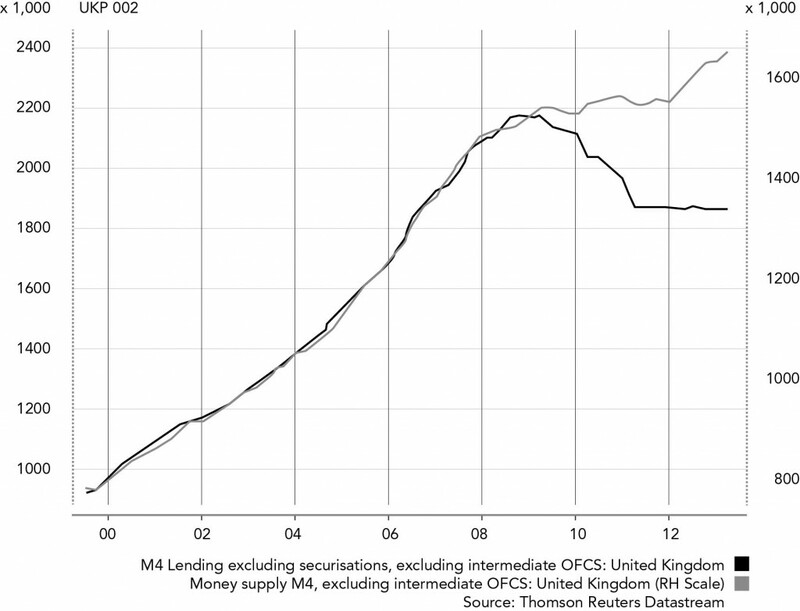 Instead of declining in a deflationary depression, UK broad money supply (M4 excluding intermediate OFCs) remained flat throughout the 2009-2011 period. However, as the chart below shows, the MPC then decide to initiate another round of QE during 2012. At least as far as any contraction in bank lending was concerned, QEII was surplus to requirements. As a consequence, instead of remaining flat, broad money supply since 2012 has expanded. Between the start of 2012 and the end of February this year, new bank lending has declined by £20.6bn yet broad money supply has instead risen by £170bn. Up to £175bn of that difference can be directly attributed to QE. 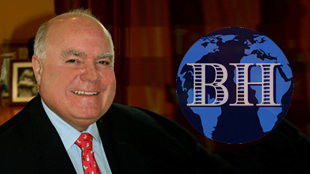 The original intention of QE, as clearly outlined in Mervyn King’s speeches in the autumn of 2010, was to prevent the deflationary contraction of broad money supply. As such, QE’s second iteration two years later had an altogether bolder remit; no less than the artificial inflation of nominal GDP; and it appears to have worked. The UK is now widely lauded as a successful growth story, the strong man of Europe and (finally) well on the way back to full employment – despite the puzzling slump in productivity that had previously been attributed to the hoarding of labour during the recession. But what if there’s a wholly different interpretation of what is responsible for the UK’s recent economic recovery? What if it’s all down to QE? We already know that on a per capita basis, GDP has barely recovered at all (see the red bars on Chart 2 below) so most of the growth we have seen has been down to immigration and bringing some of the unemployed back into work (the big increase though has been in the self-employed). If indeed the £175bn of QEII has been largely responsible for the reflation of the economy, this should only have been visible in nominal terms and shouldn’t have had much real impact, at least in theory. Typically monetary policy takes twelve months to feed through into the economy and, in purely nominal terms, last year’s NGDP was cumulatively £55bn higher than in 2012. According to the ONS, £30bn of that increase was inflation and £25bn was real growth; but if you deflate by RPI, all the apparent growth would appear to have been inflation. After real GDP growth of 2.7% in 2013, the consensus of the 38 independent forecasters tracked by the Treasury is for 2.8% growth in 2014, with the most recent forecasts averaging 2.9%. And yet 2014 won’t benefit from any QE tailwind, trade (both import and export) is shrinking, government expenditure is supposedly going to be restrained to a nominal 1.8% growth, whilst households and SMEs can still only borrow for new mortgages (see chart 3 below). That would put the onus for this year’s growth firmly on fixed investment, both corporate and residential property. It’s a big ask. Which brings us full circle to the impact of QE on the markets. In the US, QE is still ongoing, albeit at an ever-decreasing rate due to tapering, and the S&P has consequently maintained its methodically rising trend despite the lack of earnings growth. In the UK however, QE ceased at the end of 2012. It took two quarters for QE to get the FTSE back on a rising trend (the interim low was June 5th 2012) and the stock market high also wasn’t until two quarters after QE asset purchases ended (May 21st 2013). 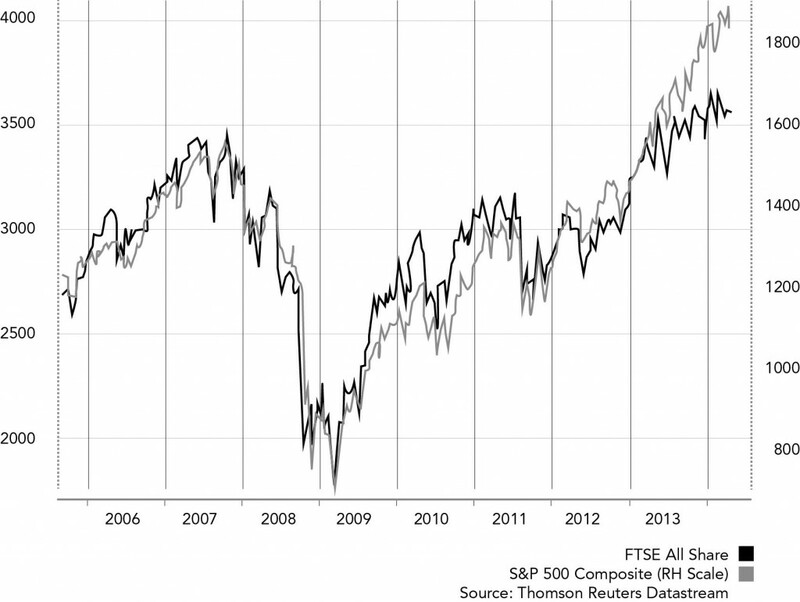 The FTSE All Share is still broadly at the same level as last year’s high. QE not only stimulates stock markets (with a two-quarter lag) but if it’s anything like typical monetary policy, the nominal economy too (with a twelve-month lag). 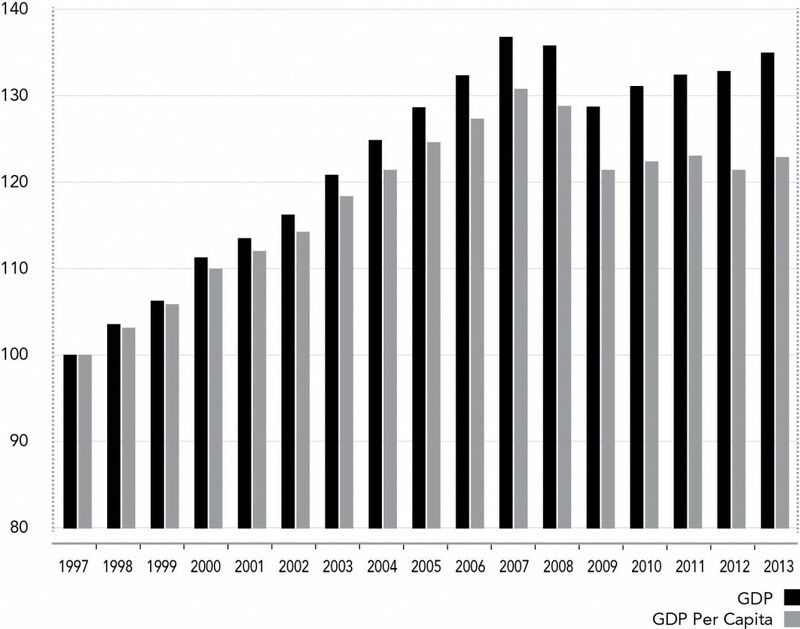 How much of the real GDP growth the UK enjoyed in 2013 was real, depends on what deflator you use. Whilst the implicit deflator estimated by the ONS resulted in a real GDP growth rate of 2.7%, other measures like RPI, which usually corroborates the ONS, suggest real growth may be much weaker. Either way, if QE was responsible for a significant amount of last year’s GDP growth, then its sustainability into 2014 has to be in question. QE also has a demonstrable and significant impact on risk assets like equities. After the appropriate lags, the stock market rally in this country has run out of steam now there’s no QE tailwind to help propel valuations. In the US on the other hand, the bull market continues apace. The difference? In the US, QE has only been tapered and isn’t on track to cease altogether until late in Q3. That should be enough to keep the S&P rising this year but might well leave US stocks adrift in 2015. The upside to no longer receiving a QE tailwind is that sterling is no longer being diluted, which explains the resurgence in the currency. Against the US dollar at least, sterling started rallying in July, soon after the FTSE lost momentum. For US dollar bulls, it looks like you too may have to wait until 2015. The views expressed in this article are those of the author at the date of publication and not necessarily those of Bow House Wealth Management. The contents of this article are not intended as investment advice and will not be updated after publication. The author : James Ferguson qualified with an MA (Hons) in economics from Edinburgh University in 1985. For the last 21 years he has had a high-powered career in institutional stock broking, specialising in equities, working for Nomura, Robert Fleming, SBC Warburg, Dresdner Kleinwort Wasserstein and Mitsubishi Securities.